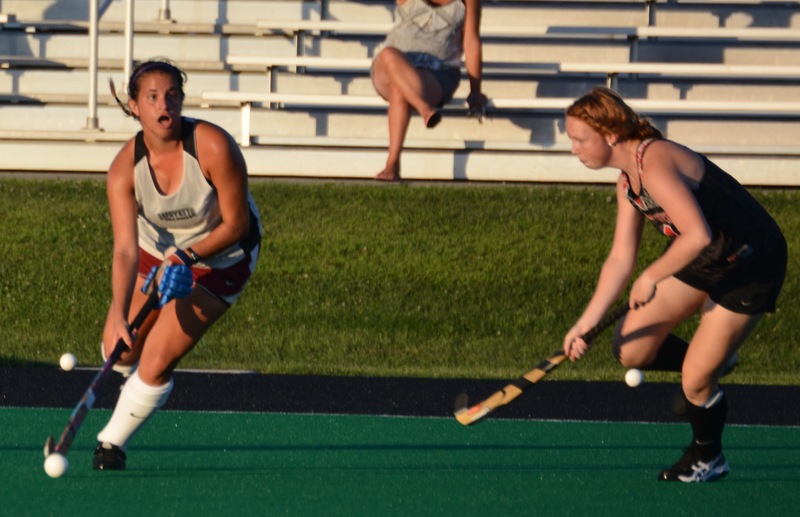 The Lafayette Field Hockey team got their first test of the year, under the lights at Rappolt Field last night against Rutgers, who entered the field with one scrimmage already under their belt. It was goalie Kaitlyn Arnold playing a standout game by turning away multiple shots on corners and also stoping several penalty stroke shots that caught the attention of fans and the coaches. If there is a better goalie in the Patriot League this year I don’t know her. Rutger’s defense was particularly effective containing the Leopard attack, but the Leopard defense turned away many Rutgers opportunities. With the score tied 1-1 at 6 minutes to go, Lafayette unfortunately received two yellow cards benching two Leopard players for 5 minutes. It was in that period with the Leopards short two players, that Rutgers was able to score making the score 2-1. Moving on to the seven on seven phase, the Leopards were to score twice while Rutgers scored once. With the field opened up Lafayette, was to use their speed to their advantage.After that there was a shoot out which would lead in the end to a Rutgers advantage of 8-7. This was a typical Rutgers/Lafayette game which traditionally are very competitive.The schools are close neighbors but were unable to find an open date this year, so the series is interrupted. I hope they will find a mutual date next year as this series is a natural considering the closeness and history of the schools. The Leopards will have Sunday off and on Monday will practice and prepare for a scrimmage at Columbia University on tuesday at 1 pm.